Kevin's Watch :: View topic - the one-millionth newbie to join? the one-millionth newbie to join? Posted: Sat Dec 13, 2014 10:34 pm Post subject: the one-millionth newbie to join? My name is Doug and I am a tremendous fan of the first and second chronicles ( somehow never got interested in "Last" ). I love not only Donaldson but also Tolkien ( of course ) and Guy Gavriel Kay, as well as some of the Charles de Lint books. I also love music, including Beatles and Alan Parsons as well as some other "classics" like ELO, Toto and Journey. I am a science buff, interested in stargazing and astrophysics as well as topics in quantum mechanics and philosophy. Looking forward to great things, here! Welcome to the Watch, Doug1964! Glad you decided to post. Yes, it was me who suggested it...elsewhere. I now see you've been a member a while. That's a good day of the year to join. As others will surely tell you, jump in anywhere. There are forums here for music and science, for politics and philosophy. The is cold seriousness and frivolous fun. May you thrive here...and contribute! Be Welcome to the Watch, Doug. Welcome to the Watch Doug. Look around and join in where ever you like. Wecome to the Watch, Doug! Will we need to be wary? 1964 was a good year - I was just 12, everything was starting to happen! Muchos gracious for your welcome, friends. Welcome Doug! 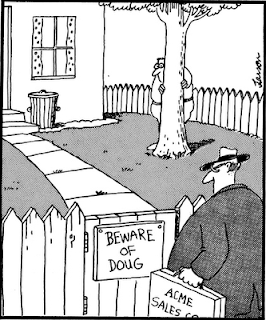 Or, should I say, "Beware" ? There's lots of topics concerning Donaldson's works here, so don't be shy and dive in and post wherever you want to, depending on what you've read. Most of the SRD forums are self-explanatory by their titles, but I would like to point out that discussions of Donaldson's Man Who mysteries and his short stories can be found in the forum General SRD Discussion and Other Works. And of course, there's the games, and try to stop by The Chronicles Art Gallery--I think you'll be glad you did! Make yourself at home, Doug1964, and post away! Let's hear what you think! Good job Cord Hurn. Now, next time, link the forum names. 1964 was indeed a good year, although I was only around for half of it. Welcome, and I'll even forgive you for mentioning Journey as the rest of the list is great!